Distressed homes - foreclosures and short sales - accounted for 25 percent of February sales, up from 23 percent in January but down from 34 percent in February 2012. Investors, who account for most cash sales, purchased 22 percent of homes in February, up from 19 percent in January; they were 23 percent in February 2012. Of course inventory is the key number in the NAR report. The NAR reported inventory increased to 1.94 million units in February, up from 1.77 million in January. Some of this increase was seasonal, and this is still a very low level of inventory - but this might be an early hint that the inventory contraction is ending. Still inventory is down sharply year-over-year; down 19.2% from February 2012. But this is the smallest year-over-year decline since 2011. Important: The NAR reports active listings, and although there is some variability across the country in what is considered active, most "contingent short sales" are not included. "Contingent short sales" are strange listings since the listings were frequently NEVER on the market (they were listed as contingent), and they hang around for a long time - they are probably more closely related to shadow inventory than active inventory. However when we compare inventory to 2005, we need to remember there were no "short sale contingent" listings in 2005. In the areas I track, the number of "short sale contingent" listings is also down sharply year-over-year. 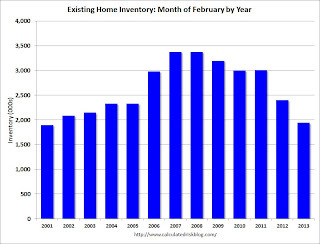 This graph shows inventory for February since 2001. In 2005 inventory kept rising all year - and that was a clear sign that the housing bubble was ending. Inventory was very high from 2006 through 2011, and started declining in 2012. 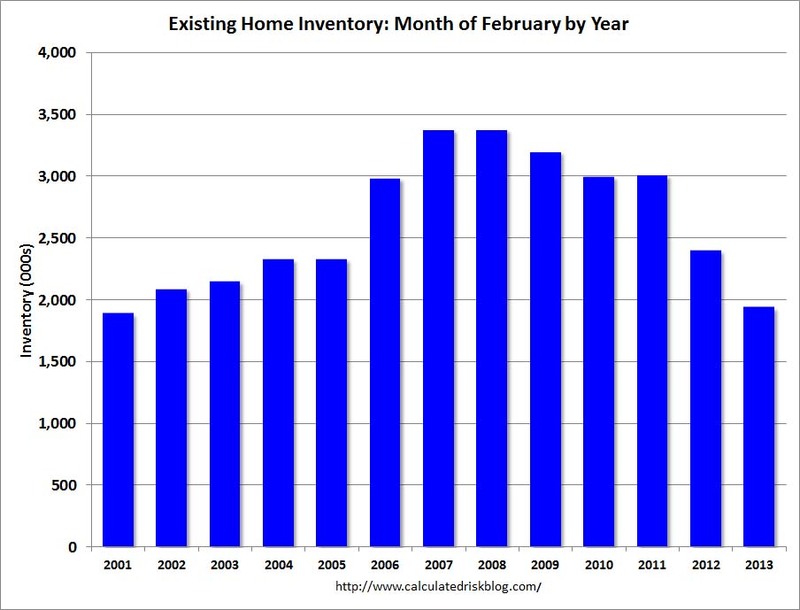 This was the lowest level of inventory for the month of February since 2001. The months-of-supply increased to 4.7 months (still very low). Since months-of-supply uses Not Seasonally Adjusted (NSA) inventory, and Seasonally Adjusted (SA) sales, I expect months-of-supply to continue to increase for the next few months. 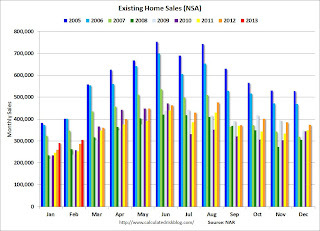 Sales NSA in February (red column) are above the sales for for 2008 through 2012, but below the bubble years of 2005 and 2006. Note that February is usually the second weakest month of the year and sales typically increase in March and peak in the summer. The bottom line is this was a solid report. 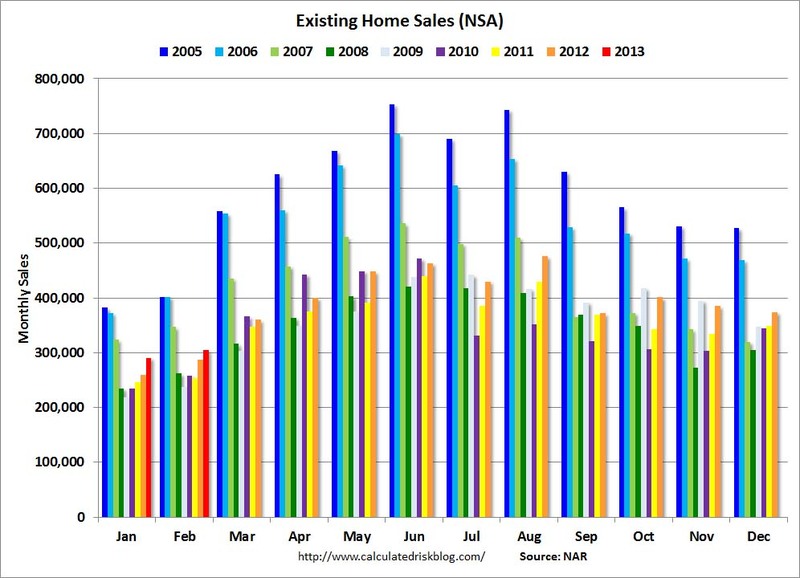 Conventional sales have increased sharply, although some of this is investor buying. And inventory is low, but we might be seeing an early sign that the inventory contraction is ending. Mortgage rates for 30-year fixed mortgages fell this week, with the current rate borrowers were quoted on Zillow Mortgage Marketplace at 3.46 percent, down from 3.55 percent at this same time last week. The 30-year fixed mortgage rate hovered between 3.45 and 3.55 percent for the majority of the week, dropping to the current rate this morning. Additionally, the 15-year fixed mortgage rate this morning was 2.62 percent, and for 5/1 ARMs, the rate was 2.3 percent. What are the rates right now? Check Zillow Mortgage Marketplace for up-to-the-minute mortgage rates for your state. *The weekly rate chart illustrates the average 30-year fixed interest rate in six-hour intervals.